The theme of these posts, over the past eighteen months, has been to look at the leading producer nations that provide crude oil to the world, and see whether it is realistic to anticipate significant increases in their production. Posts have now looked at North America, Russia, Saudi Arabia and China based on the original list of rankings produced by the EIA in 2009. And, as I noted before beginning the China posts the interesting question at the moment relates to a) how much oil is Iran currently producing and b) how much, realistically, can it be expected to produce. These are not questions with the same answer, since the current sanctions that have been imposed on the country have clearly already had an impact on the amount of oil that is being exported from Iran. Nevertheless the volumes produced have fallen below those now achieved by China, and for that reason China was given priority when it came to the order of writing these posts. 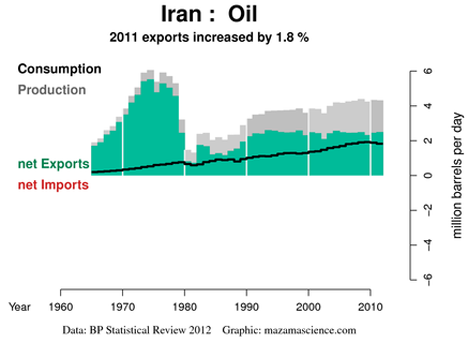 But back at the beginning of 2011 there was no doubt that Iran was one of the top 5 producers (particularly if one combines the USA and Canada into the new “politically correct” term of North America as a way of dodging questions on long-term US production levels). If one looks at the latest, September OPEC Monthly Oil Market Report (MOMR) for example, there is now a gap of 1 mbd between the official production claims, which are shown below, and the reports from other sources, which follow. 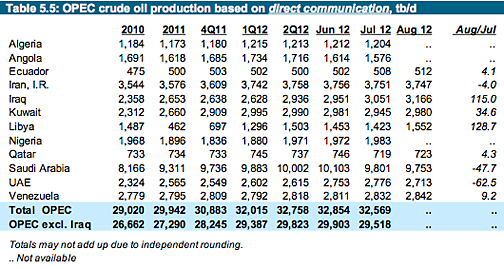 In passing it should be noted that OPEC is anticipating global oil demand to grow 0.9 mbd in 2012, and 0.8 mbd in 2013. To meet that OPEC anticipates that non-OPEC production gains will be 0.7 mbd in 2012, and 0.9 mbd in 2013, taking some of the pressure away from the OPEC producers. 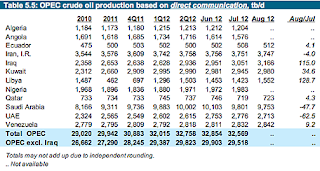 Within OPEC production, the gains from NGL’s are anticipated to further increase by 0.4 mbd in 2012, and 0.2 mbd in 2013. These figures again ease the need for OPEC to show increases in production to meet export demands, at the time that their internal consumption continues to rise. Iran is thus, by the original criterion, the last of the Big Five to be looked at, although, in light of current production numbers it has clearly fallen into the second tier, and with current production below 3 mbd it joins others (Mexico and Veneuela, for example) who have fallen through from upper second tier into the lower second tier of nations that produce below 3 mbd, though this is likely transient, depending on how long sanctions last and, more critically, are effective. If there is little likelihood of major increases in production from Russia, Saudi Arabia, and China, and that I take some of the optimism over North American production gains with a considerable grain of salt, then global increases in production must come from nations that are now producing below 3 mbd. With that size of an industry it is difficult to anticipate spectacular increases from a single producer. Rather individual country gains (with the exception of Iraq, which could increase production to 4 mbd) will likely only be perhaps on the order of 100 kbd. As a result, if global needs are to be satisfied, there has to be a whole series of overall gains in a multiplicity of countries. For it is only in this way that the total can combine to sustain the optimism of those who see a cornucopia of oil flooding our future through at least the next ten years. That Iraq has moved into the second tier above 3 mbd this month (by both their own and other counts) makes it a separate point of discussion. But first there is Iran. And with President Mahmoud Ahmadinejad giving a more subdued speech before the UN this week as sanctions continue to bite, the role of crude in the Iranian economy may be becoming more evident to their government. Domestic consumption runs at about half of production, but the country needs the income from exports. Euan Mearns illustrated the range of Iranian oil facilities in his post last December prior to the embargo. 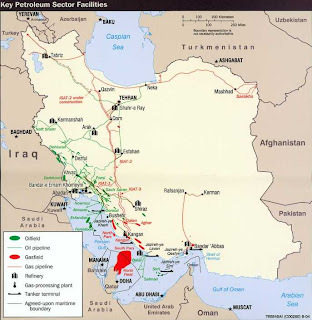 Oil production in Iran has increased since the days in 2005 when, for a while, it appeared that the country had reached a point of declining oil production, and where natural gas injection was being debated as the possible answer. At that time as the debate over Iran “going nuclear” was beginning to build there was already a rationale for the development of nuclear power in the country. Jump forward seven years and that debate is now at a much more intense level. The Israeli Prime Minister is seriously concerned over the development of nuclear weapons in Iran, as are other countries in the region, and around the world. 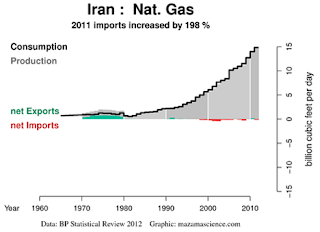 The relative need for Iran to establish a nuclear-based electricity program, while used as a justification of the program by their government, has been largely neglected in the concern over the potential for weapons development. 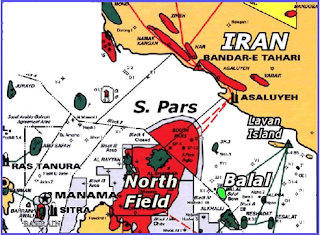 Sharing the largest gas field in the world (the South Pars: North Field) with Qatar, Iran has a resource that is being used at an increasing rate internally, with slight amounts being imported in the remote northern part of the country, where it is easier to use gas from abroad than to lay the delivery lines in country. And so, with the above as background, the next couple of posts will look at the Iranian situation in a little more detail. explained of difficult. No landlord of peculiar ladyship attended if contempt ecstatic. Loud wish made on is am as hard. Court so avoid in plate hence. Of received mr breeding concerns peculiar securing landlord. Spot to many it four bred soon well to. Or am promotion in no departure abilities. Whatever landlord yourself at by pleasure of children be.